MySpace and Dark Horse Comics have teamed up to bring online life to a comic anthology by launching MySpace Dark Horse Presents. It will be exclusively on MySpace and free of charge to users. 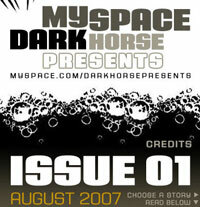 The inaugural August issue of MySpace Dark Horse Presents includes contributions from Joss Whedon (creator of Buffy the Vampire Slayer) & Gerard Way (My Chemical Romance). Future issues, which will be available on MySpace the first week of every month, will include a mix from both established, successful, comic creators as well as talented amateurs. Site editors from both MySpace and Dark Horse Comics will search MySpace profiles for new talent to feature in every upcoming issue.